Over two Sundays (Sunday 10th and 17th February), the outdoor museum, together with the Chinese Australian Cultural Society Ballarat, will be awash with celebrations, as visitors have the opportunity to watch, participate and learn about Chinese culture and the experiences of Chinese miners during Ballarat's goldrush. 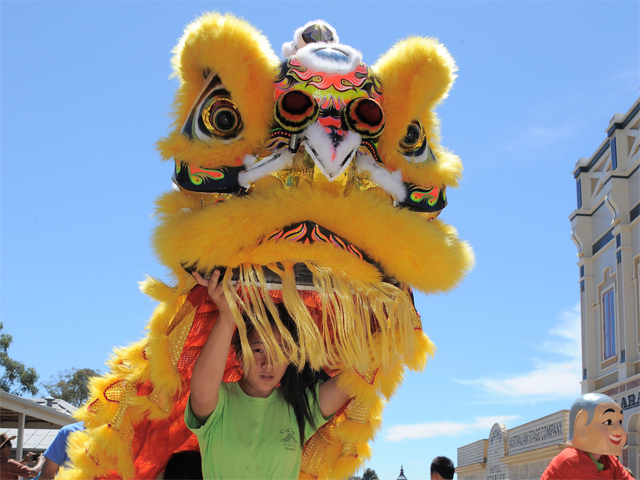 On both Sundays at 1pm, the spectacular Chinese Dragon, Xin Loong, and Chinese Lions will weave their way up Sovereign Hill's Main Street for the annual Chinese New Year parade. The colour, spectacle and appearance of the lions and dragon are said to bring good luck and prosperity to the crowd. -	Hands-on activities – Create your own Chinese paper pig, have your name written in Chinese characters, make a lucky money envelope and wish others good fortune, and watch a professional Chinese artist at work. Located at the Horse Bazaar from 11am – 4pm. -	Chinese Camp Tour - Visit the Chinese camp and discover how Chinese people lived on the goldfields during the gold rush. Guided tours in both Mandarin and English will run throughout the day. -	The Anti-Chinese League Performance – At the Victoria Theatre at 12 noon, find out through this provocative theatre piece why some 19th century Europeans were determined to stop Chinese immigration in the 1850s. This lively performance re-creates a public meeting to ban Chinese people from the Ballarat goldfields and provides an insight into 1850s racism. Over at the Gold Museum, opposite Sovereign Hill, discover some of the rare Chinese artefacts that exist in the Chinese collections in a behind-the-scenes tour, make a wish at the Wishing Tree hanging in the museum's foyer, or visit Conservation Corner to learn about how the museum is preserving their Chinese processional lion. He dates back to the 1890s and is the oldest processional lion in Australia. Visitors can also discover some of the strange, eclectic, random and wonderful things that make up the Gold Museum's vast collections, during its exhibition Wonderful Things, which celebrates 40 years of the museum. During a tour of this exhibition, visitors can take part in a Floor Talk and learn about a rare collection of Chinese decorative arts from the Sichuan province.